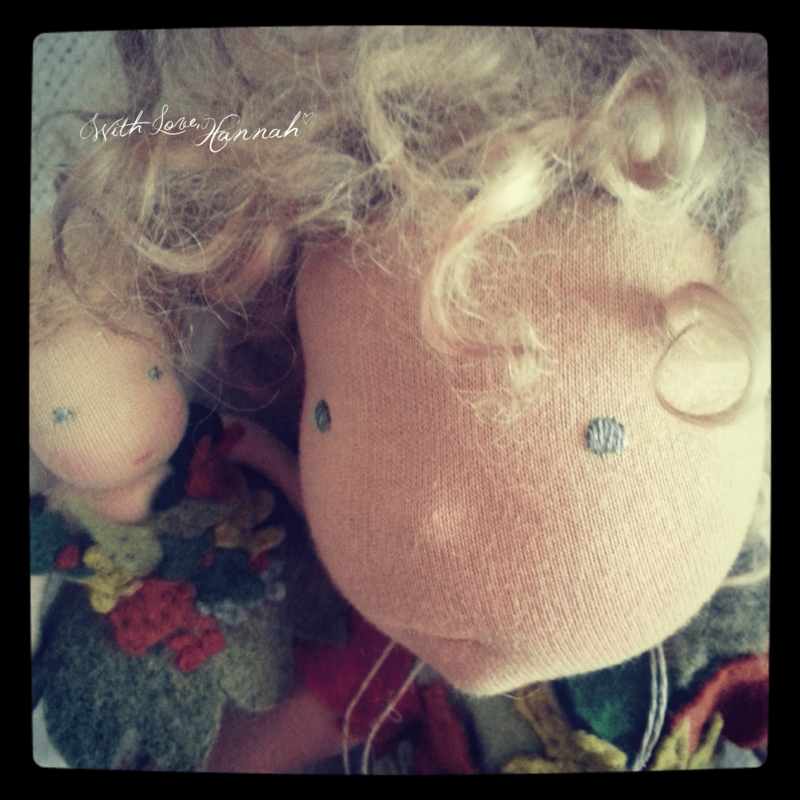 Julie Colby of Inviting Play & myself have teamed up for a wee collaboration for Dollectable upload on April 5, 2014. 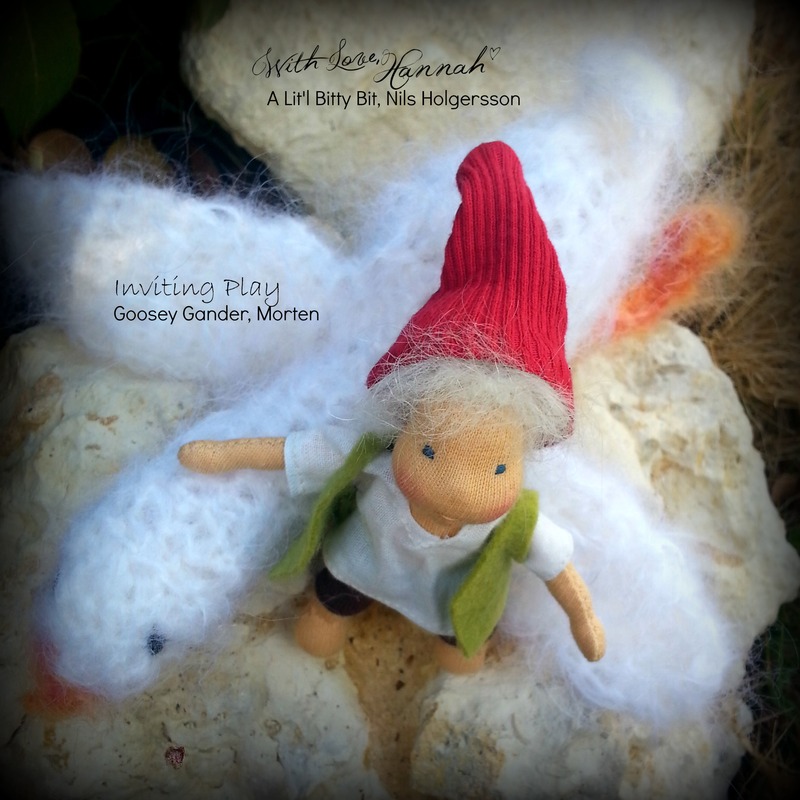 So, here is naughty Nils Holgersson, Li’tl Bitty Bit made by With Love, Hannah, along with his goosey gander, Morten, made by Inviting Play. Nils, a Lit’l Bitty Bit boy, is made with organic cotton fabric and stuffed with pure eco wool. He is tow headed using a undyed brushed mohair yarn. His face is embroidered with cotton floss. He has a tiny, sculpted belly button & bottom. Nils wears brown “leather” breeches made with cotton fabric. His shirt is a woven, pure cotton fabric & his vest is made with wool felt. His red hat is cotton knit. All of his clothing is removable. Morten the goose is crocheted with fuzzy mohair yarn and stuffed with wool. The design is a unique free form crochet design by Inviting Play and is a one of a kind creation. His tiny eyes are jasper stone beads and as such he is not fit to be a toy for young children. Nils measures 4″/10cm & fits in your hand with his goosey gander, Morten. “…A moment after the fairy’s entrance the window was blown open by the breathing of the little stars, and Peter dropped in. He had carried Tinker Bell part of the way, and his hand was still messy with the fairy dust. Click here to see all Peter & Tink’s pics. Peter measures 16in/40cm & Tink is 4in/10cm. Peter’s hair is naturally curly Wensleydale wool , that I dyed blonde. Tink has brushed mohair. She would like me to tell you she especially likes the leaves with a berry in her hair. She goes on & on about those leaves & berry on a regular basis. Both of their clothes are made from wool felt. 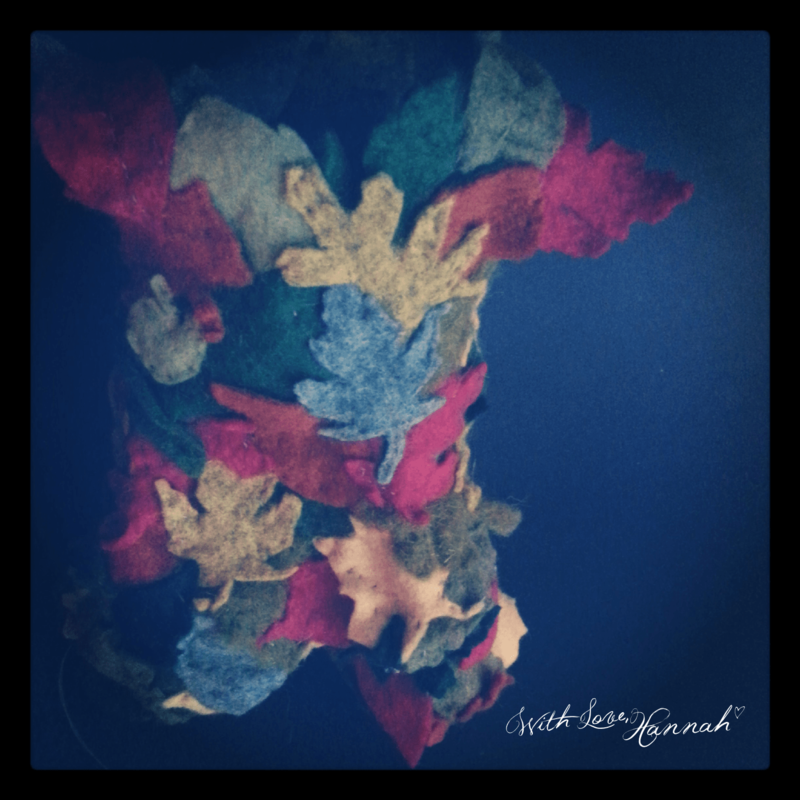 The Pan’s is hand sewn & sculpted, leaf by leaf. I stopped counting the leaves at a bazillion. Tink’s bodice is made the same way, only with much smaller leaves. Her skirt is also wool felt. 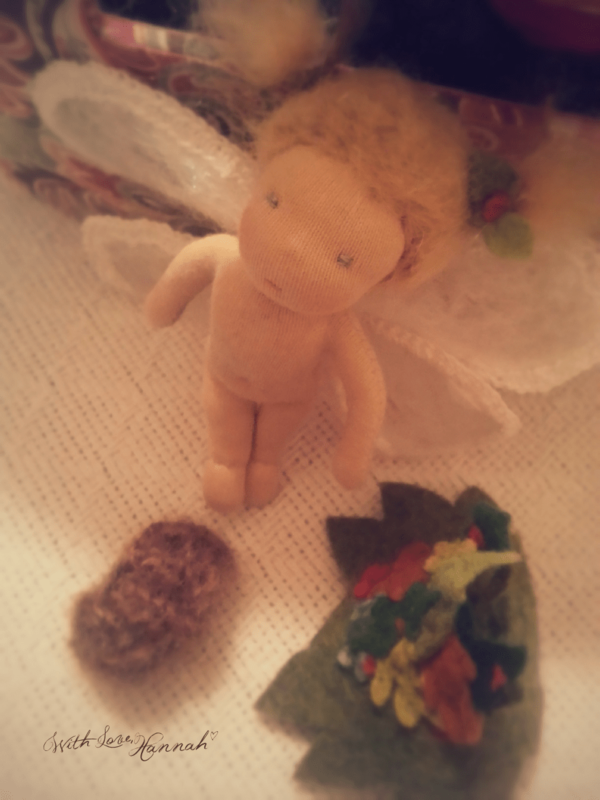 Her wings are very special…as I crafted them from a cobweb wool felt I made by hand. The wings are fine & translucent & permanently sewn onto her back. Tink also has undies made of “moss” – a.k.a. mohair dyed moss green. It’s important that fairies cover their bottoms, don’t ya think? Her little body is fully sculpted with a belly button & bottom. Peter on the other hand does not wear underwear. He doesn’t see the need. So, there you have it. Peter’s has 2 very important things he never leaves Neverland without: His kiss & his Jolly Roger belt. His kiss is from his beloved friend, Wendy. He keeps it close& safe around his neck. He likes it to be close to his heart and so he can never forget. It’s a sterling silver thimble, so Peter polishes it with moss from time to time, to keep it from getting too tarnished.